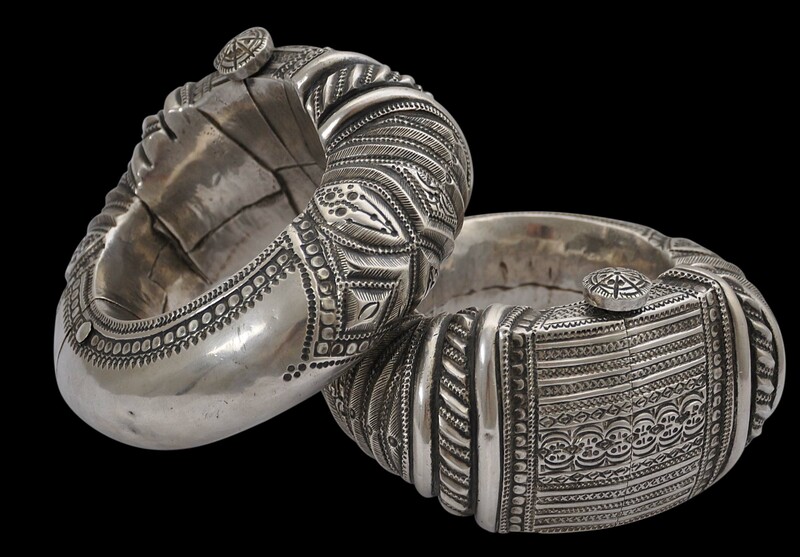 This pair of large, hollow anklets are of high-grade silver, and were probably made in Nizwa, in Oman, and were worn at weddings and at other major celebrations. They open on a hinge when the central bolt with its slightly domed finial, is removed. (The bolts pull out rather than screw out.) 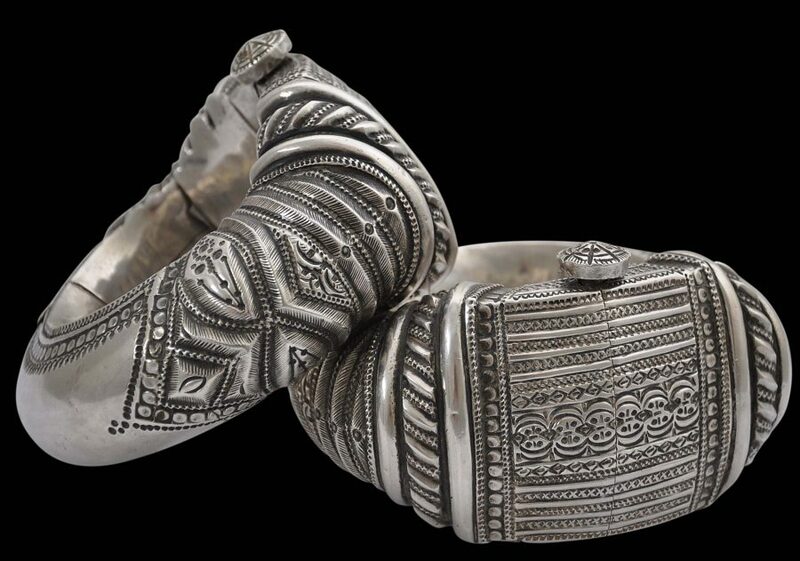 They are beautifully decorated with punch decoration, chasing and engraving work and are particularly fine examples of this type of anklet. 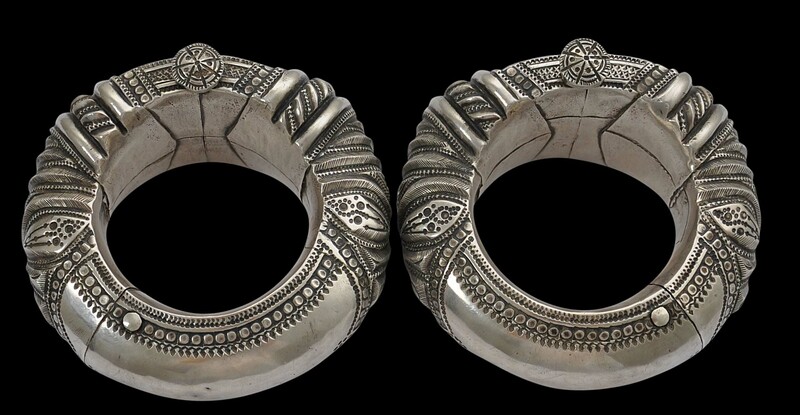 The fronts or bezels are decorated with bands of geometric motifs. The shoulders are decorated with rins and engraving work. The backs have been left plain, but within decorated borders. The pair have a fine, waxy patina consistent with their age. 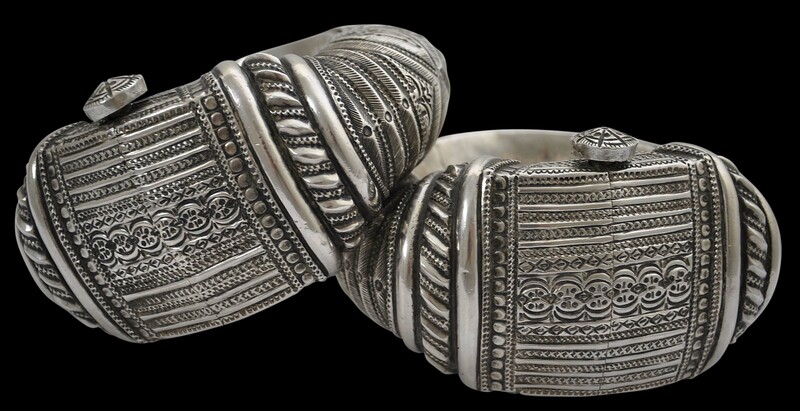 Anklets related to these were worn by women in Gujarat and also exported to Oman and Zanzibar, and from Zanzibar they travelled into continental Africa for use by local women and expatriate Indian women. Local silversmiths copied the style in Oman and with minor motif changes developed their own examples, such as the pair here. The Zanzibar-Oman connections make sense. Zanzibar was ruled from Oman and there was much trade between Zanzibar and Oman and Oman and Gujarat. 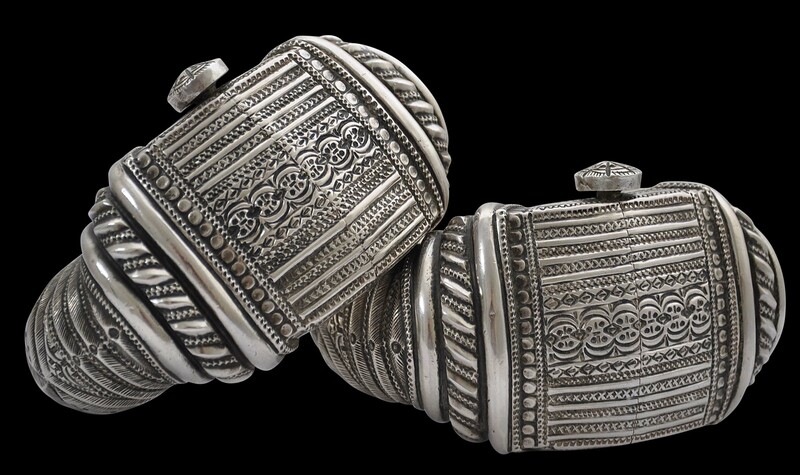 Kutch (in India) influence is apparent in the handicrafts from and architecture in Oman and Zanzibar of this period. In any event, there was much trade directly between the west coast of India, the east coast of Africa and Oman. The pair are n fine condition. They have a lovely, waxy patina, no major dents (just some small ones associated with age and wear), and would be wearable today as large bangles.